With as many fencing options as there are available, it can be difficult to decide upon a specific type and style. 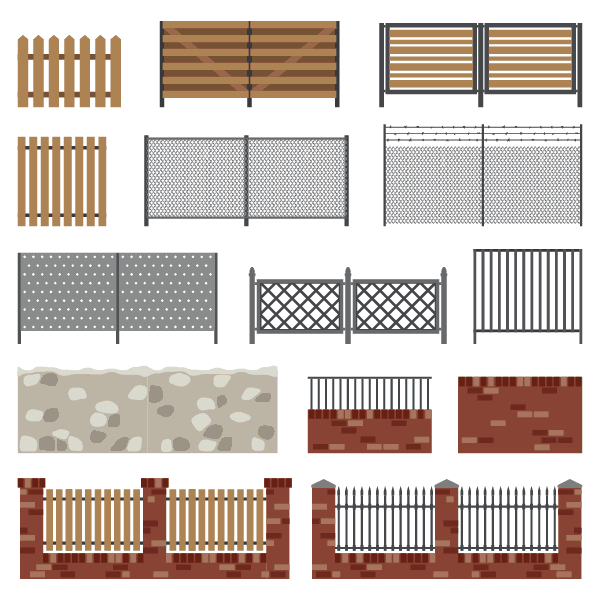 When thinking about which type of fencing is right for you, you might want to consider the below six factors. Fencing spans the gamut from very expensive to very affordable. In general, chain link fence is the cheapest type of fence that you can acquire. Wrought iron fence tends to be more expensive. The more expensive your fencing, the more durable it will usually be — and the more it will improve your property values. But that doesn’t mean you should always go with the most expensive option. If you have a large area to cover, something more moderately priced just makes sense. Privacy will affect whether you want a chain link fence or a tall wood fence. Chain link and wrought iron are the two leading fence options that don’t afford a lot of privacy but are still very utilitarian. Wood fencing can be constructed to better offer privacy, but they may also obstruct any views the homeowner wants to retain. In general, chain link fencing tends to be less difficult to maintain than wooden fencing. Wooden fencing needs to be regularly tended to if it isn’t to succumb to rot, termites, and other issues. Chain link fencing may rust or become damaged, but it can be very easily and cheaply repaired in sections. The appearance of your fencing naturally matters. As an example, iron fencing gives a classic and timeless appearance. Standard chain link fence can have its appearance improved through the use of colored vinyl inserts, but tends to be very plain. Wooden fencing can be tailored to your home’s appearance in a variety of colors and styles. It depends on the look of your home and the appearance you’re going for. Many homeowners live in an area with a Homeowner’s Association — and they shouldn’t install any fencing options until they discuss it with the HOA. The HOA may have only a few types of fences, styles, and colors that they allow the homeowner to have. Installing the wrong type could end up costing the homeowner money in fees, in addition to having to replace the fencing entirely. Certain types of fences lend themselves better to different installations. Chain link fences are best for covering larger, more expansive areas because they are affordable and easy to install. Wooden fences usually shouldn’t be installed on an incline or decline because they can buckle over time. Thus, the actual landscape will affect which types of fencing you can actually install. For professional residential and commercial fencing installation and repair by the local fence professionals at Rustic Fence that has served the Dallas-Fort Worth Metroplex for decades. Still confused? A local fencing store such as Rustic Fence will be able to give you samples of their fencing types so that you can determine which one is the best for your area and your needs. You can look at the available display models until you find the perfect fence for your home.